The Our White House book and website have garnered multiple awards. A few of the awards and citations, as well as excerpts from selected reviews, are listed below. To read a complete list, click here. More than 100 authors and illustrators contributed to this wide-ranging collection of short pieces about the First Family residence. Most participants are creators of books for youth, along with a sprinkling of other figures, such as historian David McCullough, and actual White House occupants. Arranged in general chronological order, the chapters are delightfully varied in form, tone, and subject matter. They include straightforward history, brief essays, personal narratives, and even fantasy, as in Meg Cabot’s lighthearted time-travel story. The handsome layout and excellent-quality illustrations provide strong appeal. The pairing of words and art is often inspired, as in Maybelle Mayer’s paper doll cutouts from 1938 that accompany Nancy Willard’s poem about White House dresses. There are powerful visual moments as well, such as the dazzling series of spreads featuring visual interpretations of Roosevelt’s “Four Freedoms,” each by a different artist. Many segments convey personal details that humanize the presidential families, such as Virginia Euwer Wolff’s introduction to the musical sophistication of the Tafts and Anita Silvey’s look at Jackie Kennedy’s literary career. Humor plays a role too, as in Steven Kellogg’s artistic rendering of an imagined “Best in Show” contest among White House pets. 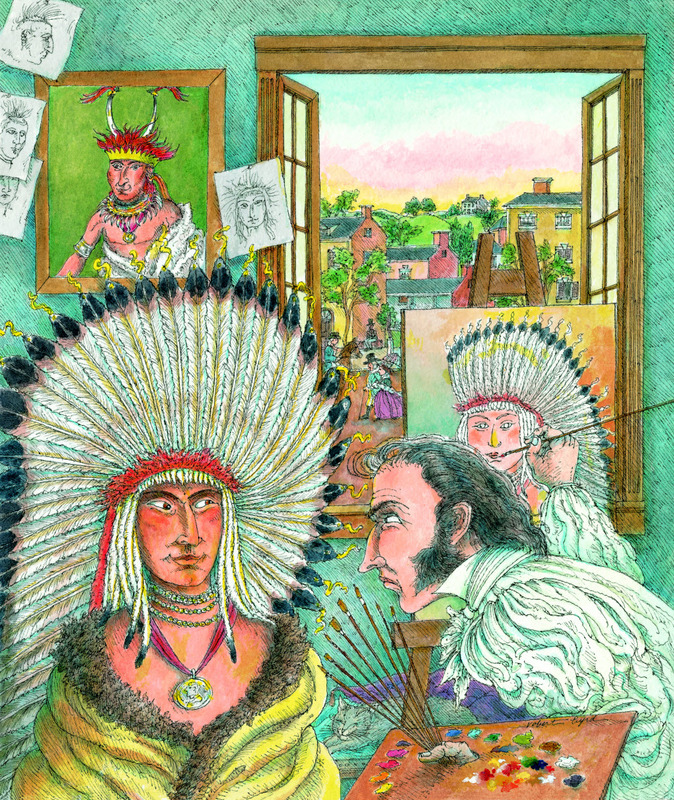 Some readers will progress straight through from Jane Yolen’s imagined conversation between John and Abigail Adams to the first National Book Festival in 2001, while others may browse and jump about; either way, this entertaining introduction to the White House is full of fascinating information, challenging ideas, and appealing artwork. Eight years in the making, this anthology of White House history convenes an all-star roster of 108 children’s authors and illustrators, as well as a few scholars and former White House employees and residents—and it is a blue-ribbon choice for family sharing during an election year. Chronologically ordered, the entries range from poems to presidential speeches, satirical cartoons to stately portraits; despite the talents of the literary contributors (Kate DiCamillo offers a poem about Lincoln’s death, Patricia MacLachlan describes Eleanor Roosevelt’s rescue of a cat belonging to a young girl), perhaps the most striking writings are those that most closely adhere to the historical record. Barbara Kerley details Thomas Jefferson’s passion for paleontology, and M.T. Anderson describes White House ghosts (Churchill, visited by a spectral Lincoln, “tapped the ash off the end of his cigar and said, ‘Good evening, Mr. President. You seem to have me at a disadvantage’ ”). But few of the writers create the same impact as the occasional document: Robert Kennedy addresses the nation after Martin Luther King Jr. is assassinated, and Richard Nixon bids farewell to the White House staff. (That young readers will react to these documents is in no small part due to the writer’s success in establishing the contexts for them.) Among the most provocative entries are works by artists who “look in” on the White House with a demonstrably personal vision: David Small shares color sketches of “backstairs at the White House,” a study in contrasts; Bob Kolar arranges the presidents as if on a board game, with clever annotations (who knew President Arthur held a yard sale while in office? ); Peter Sís supplies 37 characteristically enigmatic portraits to illustrate freedom to worship. Although a few entries seem formulaic, the volume makes the invaluable point that history does not have to be remote or abstract, but a personal and ongoing engagement. You’d be hard pressed to find anyone in America whose attention isn’t firmly fixed on the White House this year. And despite how you may feel about its residents at any given time, you have to admit: you wouldn’t mind being a fly on the Oval Office wall during a few choice moments in its history. Now, a spectacular anthology allows young readers a privileged glimpse inside the president’s home. Our White House: Looking In, Looking Out is a glorious and multifaceted collection that showcases the talents of more than 100 acclaimed authors and illustrators. 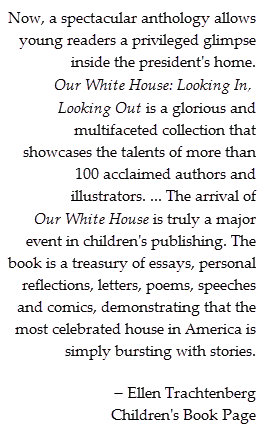 Eight years in the making, as a special project of the National Children’s Book and Literary Alliance, the arrival of Our White House is truly a major event in children’s publishing. The book is a treasury of essays, personal reflections, letters, poems, speeches and comics, demonstrating that the most celebrated house in America is simply bursting with stories. The first part of the book includes a conversation, imagined by author Jane Yolen, between the White House’s first residents, John and Abigail Adams. Later, Kate DiCamillo delivers a stunning poem about Abraham Lincoln’s premonitions of his own death. Jerry Spinelli offers memories of a family trip to Washington, D.C., in the summer of 1950 and a “Backstairs at the White House” sketch journal by David Small rounds out the display. The list of notable and prize-winning contributors reads like a who’s-who of children’s literature—there’s Natalie Babbitt, Katherine Paterson, Jon Scieszka, David Macaulay and Brian Selznick, to name just a few—and the surprising presentations will appeal to both ready and reluctant readers. Which is why a collection like this one is such a welcome addition to the bookshelf—it’s a poignant reminder that the story of the White House is the story of each of us. On the December 15, 2008 “Martha Stewart Show,” Martha advised procrastinating audience members and viewers to “Think books! I do!” as ideal holiday gifts. With that in mind New York Times book review editor Sam Tanenhaus shared recommendations of eight great books. Our White House was one of those books—the only children’s book on his list! “This house . . . I was thinking of it as we walked down this hall, and I was comparing it to some of the great houses of the world that I’ve been in. This isn’t the biggest house. Many, and most, in even smaller countries, are much bigger. This isn’t the finest house. Many in Europe, particularly, and in China, Asia, have paintings of great, great value, things that we just don’t have here, and probably will never have until we are one thousand years old or older. Our White House is a rollicking literary and visual excursion through the history and mythology, the hijinks and tragedies, and the family moments that have accrued over the course of two centuries of presidential life at 1600 Pennsylvania Avenue. The National Children’s Book and Literary Alliance has brought together the work of 108 well-known, children’s book authors and illustrators. In addition to all of the stories and pictures, editors have interspersed some fascinating bits of primary source and historical material. This is a collection of uber talent. Taking a look through the contributors list, I found sixteen authors who have been recognized by Newbery award committees, a dozen who have been recognized by Caldecott award committees, five National Book Award winners, and others who have won the Jane Addams, the Golden Kite, the CSK, and the Pulitzer Prize. Now, some might wonder whether all of that award-winner talk means that this is a book akin to high fiber and low calories: it’s good for you but not particularly tasty. But that’s wrong! Above all, I had a great old time reading Our White House, and discovered some really neat stuff. We learn from such yarns as Richard Peck’s “The White House Cow,” that up through the middle of the nineteenth century, there were relatively innocent times when one saw absolutely no iron fences, no walls, or security checkpoints around the president’s house; no armed dudes with shades and earpieces to be found anywhere. Instead, there were family cows and kitchen gardens and casual, neighborly visits. From Elizabeth Cody Kimmel’s tale, “An Unusual Guest,” we learn that Lewis and Clark sent back a prairie dog to Jefferson that briefly lived at what would (in Teddy Roosevelt’s time) come to be known officially as the White House. In just a few pages (“Sneaking into Adams Field”), Michael Winerip has converted me into a major fan of John Quincy Adams. I now want to read more about the OTHER president whose father had previously been president. In a thousand words taken from the 1865 memoir of James Madison’s former slave Paul Jennings, my belief in that the old tale of Dolly Madison being responsible for saving the famous portrait of George Washington has been seriously undermined. Those organizing the book did something very interesting here: They situated the Jennings’ memoir excerpt right next to Don Brown’s recounting and illustration of the Dolly Madison story. Thus, we are handed a stellar lesson in information literacy and a great opportunity for debate. And the illustrators! How cool is it to have the most recent winner of the Caldecott Medal joining back up with the author of The Dinosaurs Of Waterhouse Hawkins to show the story of Thomas Jefferson’s spreading crates of mammoth bones (thanks, again, to Lewis and Clark) out on the White House floor? There is a great graphic novel-style look at Herbert Hoover by Matt Phelan, a two-plus-page spread of presidents and their pets by Steven Kellogg, and – one of my absolute favorites – the six page “Backstairs at the White House: a More or Less On-The-Spot Sketch Journal” by David Small. From the little-known early-American history to be found in Walter Dean Myers’ piece “Slaves Helped Build the White House!,” to the amusing recollections from the era in which I grew up – LBJ’s daughter Lynda’s “My Room,” Our White House: Looking In, Looking Out is a lively collection of fact, story, and illustration that one can be page through and read like a magazine, or dive into and enjoy cover to cover.